Recently I was in Istanbul for two weeks in June 2018. This blog contains what I learned. Sharing it with the world in case you end up there. It's a nice city and most people are friendly but unfortunately like any other tourist destination, the opportunist minority ruin it for everyone else. Disclaimer: I loved the city and most people in it but I hated the Taxis and most shopkeepers. Once we started using public transport, the quality of our experience went up drastically. Taking the scenic (!!!) route. Swapping bills (e.g. 50 Lira bill with 5). Quoting the taximeter price in Euro or Dollar (it's actually in Turkish Liras). Dropping off the passenger at the wrong location. This happened to me. I had to lug two suitcases up a pretty steep street for 15 minutes to get to my hotel after being dropped off somewhere random. Offline mode is on by default: Meaning it will download schedules/routes/etc when you are connected to WiFi and then you can use it offline. Almost everyone has used this app so I will not elaborate. However, it does not work in Offline mode by default. Chances are you might not be connected to the internet in Istanbul. So we need to enable and download offline maps. Do this before you arrive in Istanbul and don't worry about the size. I downloaded the offline map of almost all of Istanbul and some of the surrounding regions and it only took around 400 MBs of space. It's an RFID electronic card for using the public transport. GET ONE. Our Airbnb host even gave out cards to guests to charge and use during their visit. We had already got one so we left ours with him to give to other guests. The initial price of the card is 6 Liras (in June 2018). You pay 10 Liras and get a card with 4 Liras of charge. Then you can charge your card with cash at the same machines. Just put the card on the reader and feed the machine cash. Multiple people can use it. The vending/refilling machines are available at every metro and tram station. Buy them from the vending machines and not the kiosks (or shops or your hotel) that advertise the card. They charge more. Each trip regardless of the medium (tram, metro, bus) is 2.60 Liras. Only get your card from the machines. Avoid people who try to sell you cards even if it's a deal. Avoid buying them from the hotels. In general, don't buy anything directly from your hotel. When we went to the Taksim metro station to buy our initial IstanbulKart, a man approached us and tried to sell us a card with 19 Liras on it for 30 dollars. He wanted to sell something that would have cost us 25 Liras (19 charge + 6 card) for 141 Liras. He got very defensive when we said we just want to buy it from the machine. 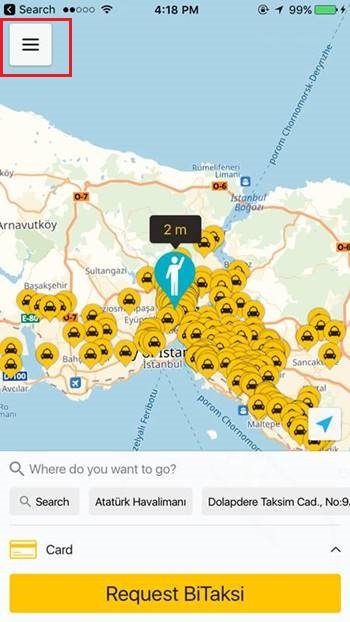 Uber was recently banned in Istanbul. BiTaksi is similar to Uber but for Taxis. You can rate drivers and see your route. This means they cannot take you on the scenic route and if they do, you can discover it. BiTaksi needs internet to start but you usually have WiFi at your hotel. More on getting internet later. After installing the application, it's in Turkish. But you can change the language (at least on iOS devices) to English by using the button on bottom right. It also has a handy fare calculator. So you can have a good idea of what the fare will be. It's an estimate but it's usually pretty accurate. You can add your credit card to avoid using cash. This way you don't need to worry about having cash or bill-swapping. My Chase Sapphire Preferred credit card worked. When you sit in the taxi, make sure the taximeter is started before the trip starts. The initial value should be 4.00 Liras. If it's not, make sure they restart it. The taximeter in older cars is near the gear and in newer cars on the left side of the rear-view mirror. The driver claims the taximeter is not working at the start. If it's in the middle of the trip, ask them to stop the taxi so you can get out. 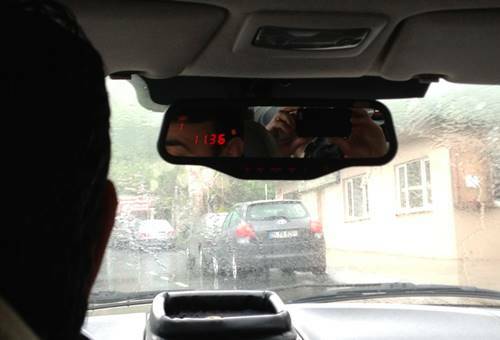 There are no day or night rates in Istanbul anymore, all taxis use the same rate. At the end of the trip, the drive usually rounds up the fare (e.g. 12.25 to 13) and puts it in the app. You can either pay cash or use your credit card. You can add a tip, it's not customary to tip taxi drivers in Turkey. I tipped a couple because they came and found us. The BiTaksi app uses your street address to give directions to the driver. When dropping your pin, make sure you do it on a street where you are and not on the intersection of two streets. This way your drive can find our easier. Most taxis (and cars) have license plates that start with 34. The license plates are very similar, so make sure to doublecheck the license plate of the taxi vs. what's displayed in the application. When you initially arrive, you might not have internet or have the application. It's tempting to use taxis at the airport. I did, the driver did not run the meter, charged me 80 Liras (initially it was 50 Euros!!!) and dropped me off at a random street! There are airport shuttles called Havabus. These shuttles service airports are quite cheap. They run from both airports (Ataturk-IST and Sabiha-SAW) to Taksim (and some stations in the middle). It's 15 Liras from SAW and 12 from IST. They run every 30 minutes (5 minutes earlier for the domestic terminal in IST) from each airport and Taksim from 4 AM to 1 AM. These buses are run by the Istanbul municipality. These are inter-city buses and the drivers help you with storing your luggage under the bus. You can also store your carry-ons on overhead racks. They are air-conditioned and quite nice. We used them extensively for commuting between Taksim and both airports. Our hotels and Airbnb were all near Taksim so we used the bus. Our Airbnb host even told us to use the bus after we booked and sent us detailed instructions along with a map on how to get to the house from the bus stop. If there are four of you (or more) and you are arriving in IST then using a taxi or van is probably better (e.g. four people using the bus will be 48 Liras and taxi will be 60 and drop you at the hotel). From SAW, the bus is much more cost effective (only 15 Liras). The busses only take Liras, so make sure you have some or get some from the ATMs in the arrivals hall. More on that later. 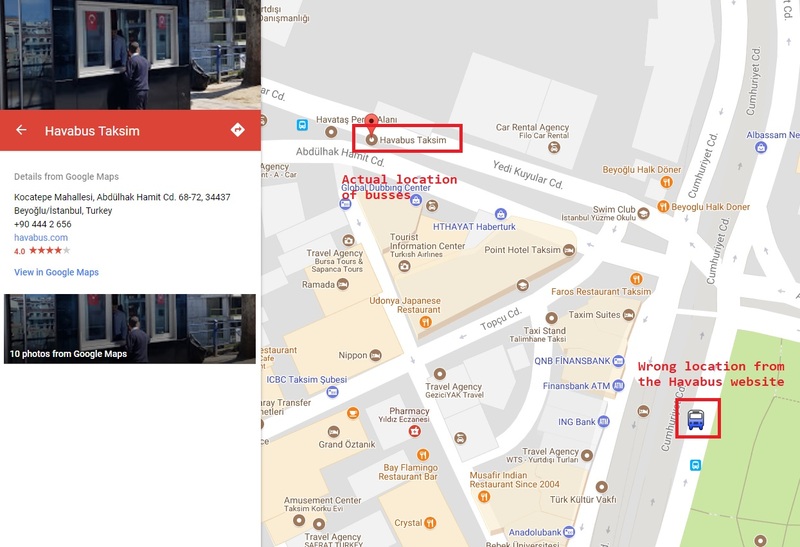 Taksim station location is marked incorrectly on their website. The actual busses are on Abdulhak Hamit street (Cd. or caddesi stands for street). Search for Havabus Taksim on Google Maps. When you leave the IST departure hall, the busses will be in front of you and a little bit to the left. 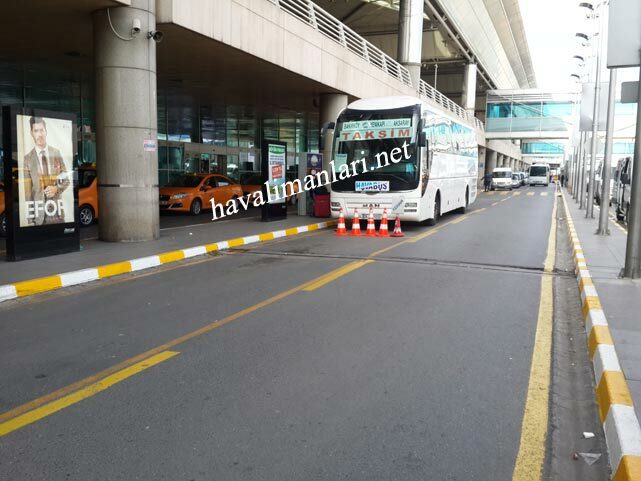 These are white busses that have Havabus/Taksim on them. There will almost always be at least one bus. You can also look for their sign. If you cannot find them, ask around. Turkey is not part of the European Union although most places want to charge tourists in Euro. The currency is Turkish Liras. If you have a debit card that is usable in local ATMs, you will not run out of money. There are plenty of ATMs around. I used the Charles Schwab High Yield Investor Checking Account debit card that I got last year for our Malta vacation. You can use it at any ATM that has the Visa logo. They also refund any ATM fees. In short, you open up a brokerage account that is linked to a checking account. The checking account has a debit card. You do not need to use the brokerage account. I carry a balance of 500 dollars in the checking account and add a couple of thousand dollars to the brokerage account before travel. As I get money from the checking account, I transfer money from brokerage to checking. The conversion rate also pretty nice and much better than exchanging dollars at exchanges. Search the internet to find plenty of guides on how to set up an account and use it. We mostly used TEB ATMs but you can use any that has the Visa logo. In Istanbul, you will see ATMs in groups in train stations and near tourist attractions. Although we never had a problem, it's advisable to only use ATMs that are connected to banks and during working hours. This way if your card is stuck in the ATM, you can go into the bank and get it. Another reason for using bank ATMs is safety. Both from muggers and skimmers. Bank ATMs and the ones in metro stations are usually monitored by security cameras so there's a lower chance that they are skimmed. The international arrival hall has five ATMs (including a TEB). After leaving customs (the green side), turn right and you will see them on the wall to your right. They are near the red Vodafone booth. Try to get a non-default amount. For example, don't get 300 Liras. This way you get 6x50 notes. Ask for 280 so you get 4x50 and 4x20 notes. Try to batch your withdrawals to reduce fees. Some ATMs also dispense Euros or Dollars but make sure to only get Liras. This way you reduce the amount of money you lose in conversions. Note: Lira fluctuates. Get money in batches and if you think the conversion rate is going up, hold on. 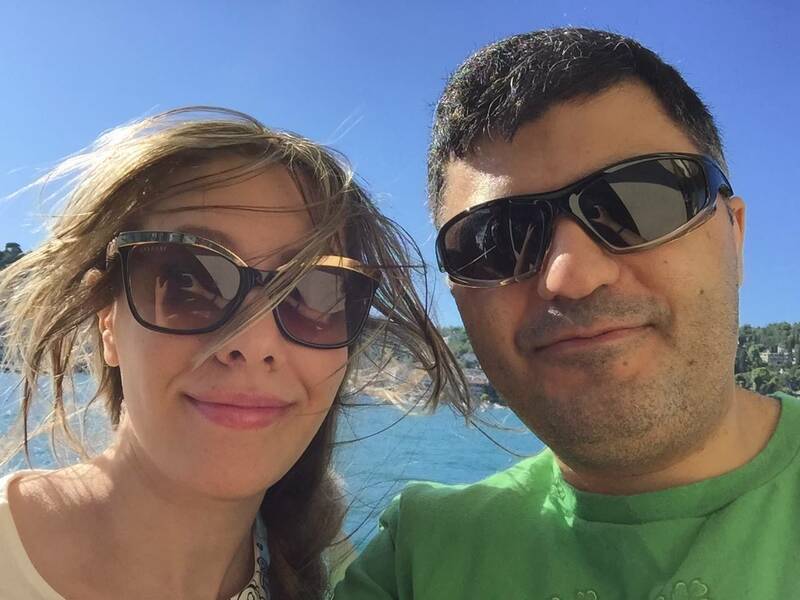 When I had just arrived I got 480 Liras from the ATM for 107 bucks. Then exchange rate went up to 4.7 Liras for each dollar and I got the same amount for 102 dollars. I mean at best you are saving a few bucks, but it was fun to min-max. Get a few hundred Liras and then get more when you run out. Don't carry a few thousand Liras or dollars in cash with you. Unfortunately, Ataturk airport (IST) only has two hours of free WiFi. And you need a phone number to receive a text message to register. That was disappointing. However, you can buy prepaid SIM cards. You have to pay for the SIM card and for the package. Avoid buying at the airport. The prices are much higher. Avoid buying the holiday packages. For example, the Vodafone price sheet from last blog post is the holiday package. Haggle, the prices are different based on the customer speaking the language or not. For example, we were quoted a Vodafone 10GB plan at 100 Liras first but when we went again, it was suddenly 120 Liras. Shop for prices in different stores of the same brand. 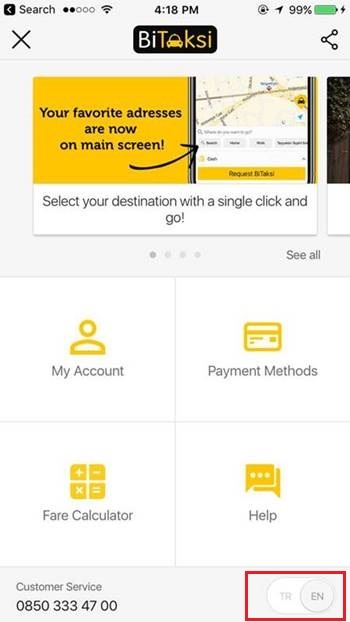 You do not need to pay 150 Liras to register your phone if your stay is shorter than 2 months. After two months, your phone's IMEI is blacklisted unless you register your phone later but chances are you will not have the same phone on your next visit. If you are inclined, buy a cheap Android phone before your trip and use it instead. 10 GB is too much, we barely used 2 GBs in three weeks. Get a 5GB plan. Unfortunately being a tourist city, not a lot of people speak English. Being Persian speakers, we could understand some words because Persian uses a lot of imported words from Turkish and Arabic. Our solution was using Google Translate. Download offline English and Turkish packages to your phone. Then type what you want and let it translate. Even if the translation is not correct, the word-by-word translated text usually conveys the meaning. This section only talks about Americans visiting the US consulate in Istanbul. I wish someone had told me but if you are going there to do something with the ACS (American Citizen Services) unit, you do not need to stand in the long visa line. You just go and talk to the guy with the iPad, show your US passport, and then go to the security door to be let in. I made the mistake of standing in the visa line for 30 minutes until the security guard noticed and let me in. I should say, it's still internally weird to think of myself as an American citizen. These are things I wish I knew before visiting Istanbul. I liked the city and most of the people. Hopefully, these can help someone else.